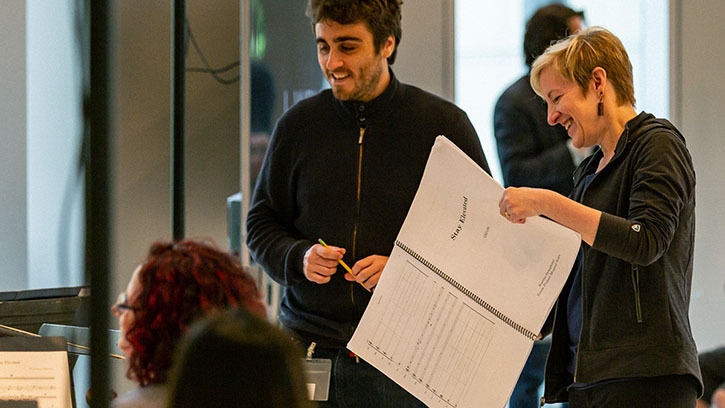 From a world premiere with the orchestra to projects in the community, the Seattle Symphony’s Composer in Residence delights in inspiring creativity. When you spend time with Alexandra Gardner, you immediately feel more creative, more hopeful. Talking with her over coffee on a rainy day in downtown Seattle, her excitement for creating something, anything, was contagious. Gardner brings one of the rarest emotions to her work — joy. It’s not to say that all her music sounds joyful, but that she delights in the medium, in the sounds that she elicits from the orchestra. Writing music takes a lot of work, she assures me, and it is not always easy. Alexandra Gardner at work in her home studio in Baltimore, Maryland. (Photo by Thom Parks). Gardner is the Seattle Symphony’s 2017-2018 Composer in Residence. In addition to writing a new work for the orchestra to perform in June, she is leading a community composition project for youth experiencing homelessness and teaching local high school composers in the Merriman Family Young Composers Workshop. This integrated approach to the composer in residence — connecting artistic projects to community service and education programs — is an ambitious model. And it takes a special composer to make the program work. Music Director Ludovic Morlot and the Seattle Symphony will perform the world premiere of Gardner’s new piece, Significant Others on concerts including Leonard Bernstein’s Wonderful Town on June 14 and 16. After learning that her work was going to be paired with Bernstein’s music, Gardner spent time reading about the American composer and conductor to learn more about his life. “I was struck by the fact that although he was always the life of the party, a real extrovert, he was also so internally conflicted.” she relates. Gardner describes the piece as “a party with a bittersweet streak running through it.” The musical material changes and transforms as the piece progresses, changing its outward appearance in each section. But the entire piece is united by a restless rhythmic motion that threads its way throughout the piece. That love of rhythm was evident in her first commission from Morlot and the Seattle Symphony in 2012 — a piece for orchestra featuring Alan White, the long-time drummer of the band YES. She fell in love with the physicality of electronic music at the time, cutting tape and layering sounds. As she began writing for instruments, she brought that freedom of experimentation to her compositions. “It was wonderful that my ears became opened to the musicality of all kinds of sounds early on. I think that was really important for my future musical growth.” Gardner adds. She wants to share that sense of creative freedom with the students of the Merriman Family Young Composers Workshop. The workshop gives local high school students the opportunity to learn about composing. They meet with guest composers and learn about writing for orchestral instruments from Seattle Symphony musicians. “I feel like I can provide experiences and guidance that will stretch them, open their ears to different sounds and musical forms, and help them connect with their own creativity,” says Gardner. Watching a session of the workshop, you can see the excitement on the students’ faces when they meet with guest composers like John Luther Adams and musicians from the orchestra. Whenever they have a moment, the students rush the piano to play for each other. But the students are also hard at work. They have twelve weeks to each write their new pieces for Seattle Symphony musicians to perform. The workshop culminates with a final concert of world premieres on June 4 in the Nordstrom Recital Hall at Benaroya Hall. Across town at the Accelerator YMCA, Gardner is working with youth from New Horizons and YouthCare on the Prism Project. Part of the Seattle Symphony’s Simple Gifts initiative, the project brings together youth to create a new composition with Gardner. One of the challenges of the project, Gardner tells me, is creating an environment where the participants feel safe expressing themselves. They started by experimenting with sounds, playing with bells and creating melodies based on the words they use to greet people. Gradually, as the participants begin to feel more comfortable, they start sharing their stories. Entitled Stay Elevated, the music is whimsical, joyful and filled with hope. The world premiere of their composition — along with visual art created during the residency — will be presented in a free community concert performed by Seattle Symphony musicians at the Seattle Art Museum on May 19. Join Music Director Ludovic Morlot and the Seattle Symphony for the world premiere of Composer in Residence Alexandra Gardner’s Significant Others on June 14 &16! Simple Gifts is supported by a generous grant from the American Orchestras' Futures Fund, a program of the League of American Orchestras made possible by funding from the Ann Gordon Getty Foundation. The Seattle Symphony’s Community programs are supported by the Ann and Gordon Getty Foundation, Citi Community Capital, KeyBank Foundation, the League of American Orchestras, the Puyallup Tribe of Indians, Tulalip Tribes Charitable Fund, the U.S. Bank Foundation, Wells Fargo Foundation, the Wilson Sonsini Goodrich & Rosati Foundation, and individual contributions to the Seattle Symphony Annual Fund. The Merriman Family Young Composers Workshop is generously underwritten by the Merriman Family Foundation. The concert is presented as part of the Seattle Symphony’s New Music WORKS initiative, which is supported in part by a grant from the National Endowment for the Arts. New Music WORKS features commissions, concerts and educational activities that use composition as a catalyst for collaboration and engagement in music. Additional support for The Merriman Family Young Composers Workshop is provided by Michel and Christine Suignard.